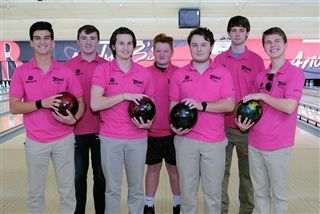 Congratulations to the Varsity Boys Bowling Team for placing #1 in the Andy B's Conference with 40 wins and 23 losses. Zach Yuan was named a member of the Andy B All Star Team for rolling a 331 for 2 games. Logan De Los Santos was named the 1st alternate after rolling a 318 for 2 games. Good luck to the boys' and girls' teams as they compete in the Regional Bowling Tournament at Sahoma Lanes in Sapulpa this Saturday morning. Congratulations to Bowling Coach Brother Nick Mullarkey for winning the “Coaches Game” yesterday at Sahoma Lanes. The two Strikes he rolled put him ahead of Coach Pilgrim and Coach Weaver.